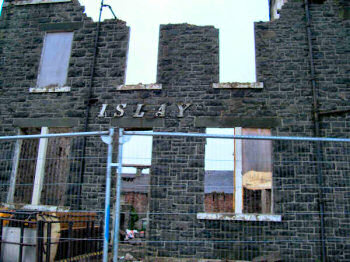 IslayBlog.com -> 2007 -> Two Islay Hotel(s)? No, no, there are more than two hotels on Islay. This entry is about hotels called ‘Islay Hotel’. The first one will soon be gone to reemerge as a new Islay Hotel, the second one quite possibly is entirely fictional. Regular readers will remember that I've written about the Islay Hotel in Port Ellen previously. The first mention I can remember was in a bilingual entry about Islay more than a year ago. More recently I wrote about the now under way redevelopment and the demolition of the old Islay Hotel. Last night I was sent more pictures with the progress of the demolition. The one above quite nicely shows the progress over the last few days, I find it quite funny that the ‘Hotel’ is gone while the ‘Islay’ still remains. Now the other one, which I think is possibly entirely fictional. I stumbled over an Islay Hotel mentioned in Tinker, Tailor, Soldier, Spy, a spy novel by John le Carré. One of the characters from the book (called Smiley) stays at the ‘Islay Hotel’ in London. According to another blog entry I found the Islay Hotel is in Victoria, London. A bit of googling didn't get me anywhere, so either it is long gone (after all the book was published in 1974) or was fictional in the first place. Any readers from London having any thoughts about this or know more? Was there ever an Islay Hotel in Victoria?